Three players competed. A toss-up question was asked by host Ober at the outset, and whoever buzzed in with the correct answer got to select from one of 9 "Channels", each representing a category of questions from the world of television. The first question in each round was worth 5 points, the second was worth 10, and the third 15. The last correct answerer got to choose the next channel. Some channels concealed a special game ("Survey Says...", "Beat the Bishop", etc. 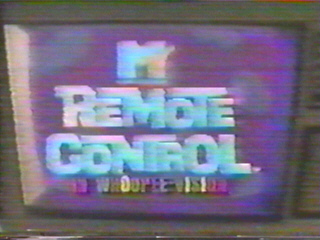 ), others hid penalties ("The Home Shopping Channel", for example). After the first round (and a snack raining down from above), a second round was played with 9 new channels and questions worth 10, 20, and 30 points. At the end of the round, the lowest scoring player was eliminated from the game (or sent "Off the Air", as the show put it), and a final round was played between the remaining two contestants. The MTV version had a speed round, with each answer worth 10 points. The syndicated run involved the players solving a math problem in 20 seconds, wagering a portion of his/her score. The player with the highest score won the game and went on to the bonus round. The winner was strapped into a Craftmatic adjustable bed, facing 9 television monitors. Each monitor played a music video, and the player had 30 seconds to identify the artist of each video. Each video solved meant the contestant won an increasingly valuable prize. The winner was strapped into a contraption affectionately known as the "Wheel of Jeopardy", which was surrounded by 10 TVs. The wheel began to spin, and the host began reading questions. Every question answered correctly changed that question number's monitor to read "Grand Prize". After all 10 questions were read, the wheel slowly began to slow down, and if the player's head pointed to a "Grand Prize" monitor, the player won the grand prize. In one episode, game show host Bob Eubanks made a special guest appearance, apparently to give Ken Ober a few pointers about being a host. More of a send-up on the game show genre, but it has a pretty interesting game behind it. You're not going to be too entertained with this show if you're not a fan of classic TV, or if bizzarity like watching a guy laugh the tune to TV theme songs isn't your cup of tea. I loved it as a 10-year-old, but nowadays some of it kinda falls short. Still, Ken Ober's hosting style is nice to watch, although for a guy who supposedly grew up watching game shows, he doesn't seem to have the right technique. Cool set, though, and I liked the audience participation.